With this stylish 10 inch bamboo Lenovo Smart Display, you’ll discover loads of awesome new ways to help manage your home. It cleverly combines all the benefits of Google’s virtual assistant with a high-quality interactive touchscreen, making it much easier to multitask hands-free. Once it’s set up, you can ask questions, set reminders, read the latest news, watch videos, stream music, or control any connected smart device remotely using a few simple voice commands – just say “Hey Google” to get started. Make your mornings a little easier with customisable routines that respond to a specific instruction, carrying out several tasks at once with a single request. 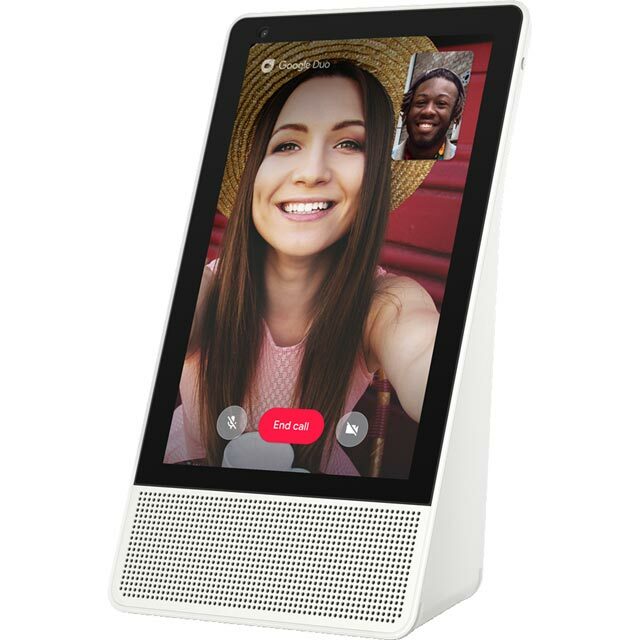 Plus, the built-in camera makes it perfect for video calls with friends and family, bringing you all a little closer together. There’s a whole world of entertainment at your fingertips – and on the tip of your tongue – thanks to this smart display’s video features. Ask it to find a recipe on YouTube, or play your favourite music videos, and it’ll happily show you what you’re looking for. Then all you’ve got to do is enjoy the crisp high-def display and crack on with the cooking. The built-in camera allows for effortless video chat with friends and family. Using Google Duo, you can simply say ‘call grandma’ and up she’ll pop on the screen, with no need to swipe through your address book or type in a phone number. You can even flip the display into portrait mode to get the best view of whoever’s grinning back at you. As well as keeping you connected, there’s a couple of handy features that give you some privacy when it’s needed. You can switch off the microphone, and there’s also a physical camera cover that you can slide across the lens. So, if you need to disconnect from the world for a bit, you’ve only got to flick a couple of switches and you’re free to relax with your family. I've read many reviews before I bought this one and I'm very happy with the choice. The screen is sharp and looks great in my living room. The speaker quality is good and loud. I prefer this much better than Alexa as it plays Youtube videos with voice, and can control Netflix on my TV. I also like that it displays the text of my query when I say things so I'm sure it's listened to the right command. In general pick up is very accurate. I use this device daily now. Overall very nice, fairly easy to set up. Fairly intuitive. Don't like the Google Home app much, also wish there was a way to make the screen more touch sensitive, ie, for making and receiving video calls. I have it linked to spotify and will play around with some other features, but initial thoughts are that this is a pretty decent product and I prefer it to the Echo. its ok so far, but there is many potential in this device. its OK so far, but there is many potential in this device. trying to wean my self off smartphone usage through out the day. Had Amazon Echo Show but had to return it as it developed a fault. Instead of buying another, I opted for this and really like it! There's a lot of difference between the Show and this and it does take a little getting used to. The quality of the Lenovo is great; the sound quality is excellent and you have the option of connecting it to Bluetooth speakers. The display quality is also excellent. I chose the 10" screen version as I felt it would be easier to read than the smaller 8" version. If you're getting a Google Smart device then I would choose Lenovo's over Google's own as the device seems so much better. If you can't choose between Alexa & Google then I'd say compare them and decide what you're going to use them for. Google is great for searching online and Alexa is great for Amazon's own products (Prime video, Prime Music, Prime Photos etc). It's impossible to say which is the best as whilst they are fundamentally the same they are very different.